For the second year in a row, a massive wildfire scuttled our plans to take to the mountains for one last gasp of summer. Lake Tahoe, Russian River…any old body of water will do. That’s another thing to love about Northern California. Babygirl was carefully laying her babies out for a rest on the deck in the waning light. “Thank you for telling me! I’ll bring her inside,” I responded. “Can you at least finish cooking?” we asked. 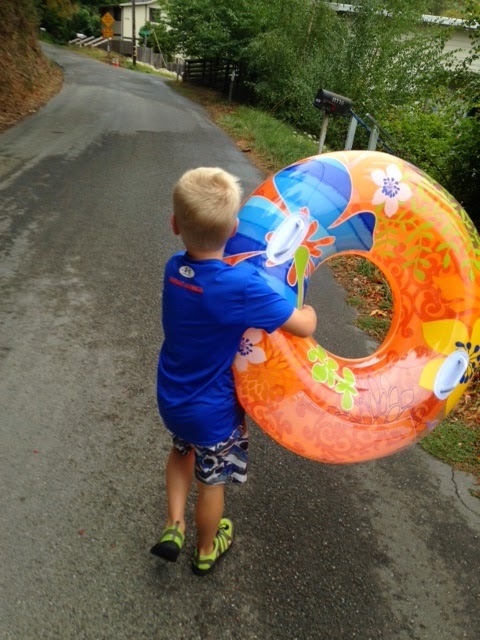 Despite a drizzly start to the following day we hauled the tubes to the river after breakfast. Wet is wet, we figured, and children operating in sleepover mode need air. Our nearest beach was at the base of a dam, which generated sufficient rushin’ to appease the boys, who could not figure why a Rushin’ River would move so slowly. Fording, floating, throwing and splashing; rocks and mud and the requisite, quiet fishing boat nestled in a nearby marsh. Babygirl and I ate string cheese on the cool bank and listened to the boys howl in mock fear as my husband launched them downriver in their tubes then chased them down. Chilled and sufficiently waterlogged, we eventually made for pulled pork and beers at the local smokehouse, where the kids played air hockey on a large deck over the river. We were 8 people with full bellies and heavy lids as the sun finally made her midday appearance. We started Transformers on the sole TV back at the house, leaving the the adults with two choices: to nap or to work out. Babygirl and I opted to kill two birds with one stone, and we struck out, me in my New Balances and her in the umbrella stroller, rumbling jerkily over the uneven road. A faded sign threatened No Outlet, but the trees offered shade and quiet, and the dead end promised little car traffic. Babygirl hummed quietly until that fine mop of blonde hair dropped down over her chest. Sleep. I kept going, for all intents and purposes alone on the sun-dappled road. Past houses in various states of disrepair; a decrepit, re-purposed US Mail van; a station wagon; a trailer loaded with a speedboat. Through a warm patch of air bearing the faint, lazy scent of weed in the afternoon. I noticed a tumbledown mailbox next to an iron gate, and above it an enormous tarp-tent held together with bungee cords and barbed wire. A radio hummed somewhere in the trees and I flirted with the dark notion that this is a place where people disappear. Survivalists. Unsuspecting urban dwellers who compulsively exercise on rarely-traveled roads after their pulled pork lunches. My mind turned to wildcats. A previously-unnoticed dog locked in a parked car by the road barked loudly, startling me. I sped up, finally reaching a tall fence with a sign reading, simply, END. Turning around, I pondered our well-meaning neighbors, their warnings (admonishments?). I thought about how we noticed no one, but they noticed us — watched us, even, unloading our kids and our twin Subarus full of Trader Joe’s bags, lighting the contraband coals on our rented grill. We were interlopers, weekend-trippers. Left to our own devices, our ignorance of the local landscape could prove disastrous: a forest fire, a mauled child. We needed to be protected from ourselves. I had reached the beginning of the road again, but Babygirl was still sleeping. So instead of heading to the house I turned down towards the river bank. Another concealed dog heard our rattling approach and sounded the neighborhood alarm. An echoing chorus of barks followed me all the way through the residential street, only fading into the distance as I approached the beach and the bridge over the dam. Silence, and the river. I have a tricky relationship with silence. I don’t trust it. I always have the uneasy sense that the silence is hiding something, that silence is just another form of concealment at best, or a sign of danger at worst. Any mother knows that as long as the kids are playing or arguing or singing in the next room they’re okay; the minute you notice they are silent is the minute you run back to check on them. Nonetheless, standing on the bridge over the dam I turned my face up to the afternoon sun, breathing in the damp, woody scent of the banks. I closed my eyes, even though it felt a little forced. This is what you are supposed to do in nature, right? Be one with the silence. Maybe I’ve read too much Raymond Carver: the weighted sound of a car on the gravel leading to the bridge, a cell phone ringing somewhere downriver, the crunch of a single footstep on the beach below…I considered how a place can be at once idyllic and vaguely sinister. Hauntingly beautiful: that’s the term. Suddenly I craved the company of my people: someone cracking a joke, cracking a beer. The kids jumping on the bed and begging for tickles. The clutter of Legos underfoot that seems to follow me everywhere. The slap-slap of tiny feet in tiny flip-flops. Babygirl stirred, and we turned home, past the barking dogs and the No Outlet sign, past the neighborhood watch. 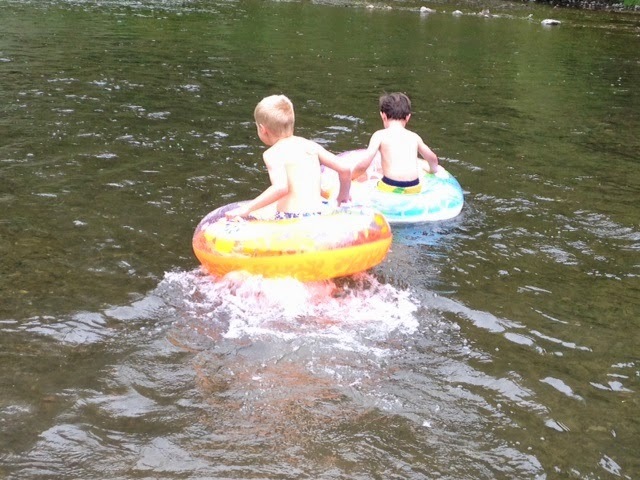 The afternoon would bring a second visit to the river, a few loads of laundry, chicken fajitas and birthday cake and long, rambling conversation as tired littles nodded off in spite of themselves. Good fortune, and a stolen weekend on the river.